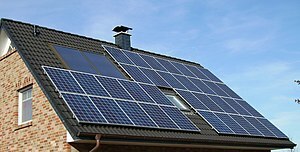 Home » Solar PV » How Much Does it Cost to Install Solar on a Roof Top? How Much Does it Cost to Install Solar on a Roof Top? HOW MUCH WILL IT COST TO INSTALL SOLAR ELECTRIC (PV) IF MY GOAL IS TO MAXIMIZE MY AVAILABLE ROOF SPACE? If your goal is to eliminate your electric bill but don’t have enough roof space or land to build a ground mounted system, then the next best thing to do is maximize your available roof space with southern exposure. Taking this approach we can tell you what percentage of your electric bill will be off-set by the power produced from the solar array. The first thing you’ll want to do is determine your last 12 months of kWh (kilowatt hour) usage (see Part 1 and Part 2 of our last Blog Post for instructions on how to determine this). (we do this during our site analysis). The roof dimensions will determine the size of the solar system, while the tilt and orientation will determine how much power (electricity) the system will generate given its size. It’s important that your roof have at least some southern exposure. If yours does not, this does not mean you shouldn’t install solar… it simply means that your system will not produce as much power and therefore your return on investment will not be as great. The ideal orientation for a roof is 168 degrees from north. However, anything from 135 – 205 degrees from north will yield 95% optimal results; and from 115 – 225 degrees will yield a minimum of 90% of the optimal results. Whereas, if you have a roof that faces directly east then your system will only produce at 78% of the optimal level. Likewise, if your roof faces due west then it will only be 69% of the optimal level. So as you can see, just because you don’t have a south facing roof, doesn’t mean your solar system won’t produce… it just means it won’t produce at the optimal level. However a north facing roof line is not well suited for solar here in the northern hemisphere. The optimal tilt for solar panels in Northern Colorado is a 40 degree pitch. Most roof tops aren’t this steep but even a 20 degree pitch will provide very good results. Unless your roof is fairly flat, we typically recommend a flush mounted system since the incremental increase in electricity production usually doesn’t justify the additional cost associated with increasing the tilt of the panels. However, if your roof is fairly flat then it definitely makes sense to use a tilt-up racking design. Once the roof dimensions, tilt and orientation are established we can then determine how many solar panels your roof will hold and how much power the system will produce. As a very broad based rule of thumb, each kW (kilowatts) of solar panels installed in Colorado will generate around 1,300 – 1,600 kWh’s annually, depending on the tilt and orientation of the solar panels. In addition to size, there are many other variables that impact the cost of installing solar, which we evaluate during our site analysis (ie – breaker panel and electric service, roof structure and material, rafter/truss system, meter location, point of grid interconnection, conduit runs, etc.). However, getting to the heart of the question, the total turn-key cost of having solar installed on your home or business will typically be between $3.50/watt, for larger solar PV systems, and upwards of $6.50/watt for smaller systems. However, anyone who installs solar on their home or business is eligible for a 30% federal tax credit (this is not a tax deduction; it is a tax credit… a dollar for dollar reduction in the taxes you pay to Uncle Sam), thereby reducing your installed cost by 30%. Also, many utilities offer rebates and/or REC (Renewable Energy Credit) payments based on the size of the solar system and the amount of power it produces. These utility rebates can also drastically reduce the cost of installing solar. Please call us at 970.482.SOLAR (7652) if you want to find out what rebates your specific utility offers. Putting it all together… we’ll use an example addressing everything we’ve discussed in this article, using the following assumptions: your kWh usage over the last 12 months was 15,325kWh’s and you don’t anticipate any change in your future usage; your roof, which faces due south (180 degrees from north), has 625 S.F. of shade free space available and has a 24 degree pitch; and of course you want to maximize the available roof space and determine how much of your electric bill will be off-set by the electric produced from the solar system. An 8kW roof mounted solar PV system installed by Alt E would cost around $35-36,000 ($4.50/watt), at today’s prices. Taking the next step, using $35,000 as the installed price, you will receive a federal tax credit of $10,500, thereby bringing the cost down to $24,500. Now let’s assume your electric utility pays you a REC payment of $.13/kWh and your electric rate is $.105/kWh (this is Xcel Energy’s current REC payment price for “small solar PV systems” and its current residential electric rate). Your solar system will save you $1245/per year at today’s electric rates (11,859kWh’s produced x $.105/kWh = $1245.19 annually), PLUS Xcel will pay you under contract $1542 annually (11,859kWh’s produced x $.13/kWh REC payment = $1541.67) for each of the next 10 years (paid monthly)!! Therefore the total annual financial benefit to you is $2787 ($1245 in annual savings + $1542 in REC payments = $2787). To do a very simple payback analysis, simply divide the net cost (after your federal tax credit) of $24,500 by the annual financial benefit (savings and REC payment) of $2787 to determine that the payback timeframe is 8.79 years. However, we all know that electric rates are only going up (average annual electric rate increase over the past 30 years has been 6.7% annually – doubling about every 11 years), so if you factor in this rate increase going forward, then your actual payback time frame is more likely around 7.5 years. This equates to an approximate 14% annual return on your investment! However, if you want to calculate your true return on investment (R.O.I.) then it’s important to take into consideration the tax ramifications. Since savings on your electric bill are not taxable, in order to compare the true R.O.I. with other investments, which are taxable, you must ask yourself, “What would I need to earn on a $24,500 investment in order to net $2787 annually from that investment, after I pay taxes?” To answer that question, let’s assume you are in a 25% tax bracket. If that were the case then you’d need to earn $3716 from that $24,500 investment in order to net (after taxes) the same $2787 from your solar system ($3716 less 25% tax of $929). Looking at it this way (which is the proper way of calculating actual R.O.I. on your solar investment), then a simple calculation shows a payback timeframe of 6.59 years ($24,500 divided by $3716 = 6.59 years). Once again, factoring in electric rate increases, your actual payback timeframe is about 6 years or an annual return on investment of almost 17%… where else are you going to get a risk free (a contract with a utility company is about as safe of an investment as there is) return on your investment that’s anywhere close to that?!!! WHY ISN’T EVERYONE DOING THIS??? By Alt E Wind & Solar in Solar PV on February 26, 2013 . I would like to show my appreciation to you for rescuing me from this incident. not pleasant, I figured my entire life was over. my career if I hadn’t encountered your web site. this. I am able to at this point relish my future. to any individual who needs and wants direction about this subject.